This week's challenge was rather interesting. My husband sent me an email with the title "today's challenge" and the link. I clicked on the link and it started play music. My challenge was to cook a meal based on the music I heard. What I Made : Pork shoulder roast with four different sauces. My note : I did some reasearch about Schubert and quickly focused on his birthplace, Austria. 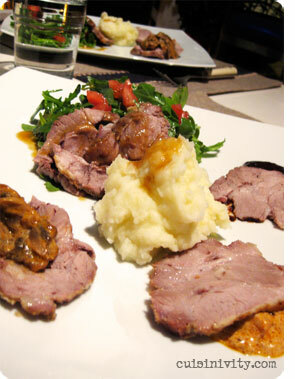 When I think about the Austria, slow cooked pork roast came to my mind. I was lucky that I just purchased a pork shoulder roast at the farmer's market the day before and it became very useful. Now I had to develop something from there. I thought about "fantasy" food from the title... What is my fantasy food? Lots of truffles? Eventually I discovered that "the Fantasia" has nothing to do with fantasy in normal terms. It is a musical composition with its roots in the art of improvisation. After some more researche, I found that The Fantasia in F minor has four movements and I thought it would be fun to make a different sauce based on each movement. "The piece opens with a lyrical melody with dotted rhythms that is reminiscent of the Hungarian style." -> Hungarian paprika, fresh tomatoes and sour cream based sauce. "The third movement scherzo is a bright, lively A major, that is reminiscent of the scherzos of other works...." -> Bright and lively. I want to pair the pork with bright colored greens with light and white wine based sauce that brings out the pork flavor. "The finale begins with a restatement of the first movement's primary theme in both F major and F minor before transitioning into a fugue based on its second theme. Repeating the Hungarian style but something harmonically interdependent." -> I used the same Hungarian paprika and sour cream based sauce as the first movement but I added mushrooms instead of tomatoes and added more flavors like garlic, dijon mustard and Worcestershire sauce. His verdict : I love pork so how could I argue with a meal with four different versions of pork? The pork itself was wonderfully soft and juicy and with the right amount of flavor. Then the accompanyments. The first sauce was a hit. I loved the sour cream and paprika combo - not sure it reminded me of Hungary, but I see what you were thinking. It was velvet goodness with a little kick. The prune sauce was thick and rich, and certainly went well with the slower, darker second movement (we listened to the 20 min composition during the meal). The salad went fast, along with the movement itself. No special taste but I suppose that light touch was the point. And lastly, the mushroom paprika. Probably my least favorite sauce, simply because it didn't have the consistency of the first sauce but on the other hand the paprika hid the mushroom taste. But I see how it is a variation on the first movement at the finale. Overall, I liked the idea of a separate component for each movement. I somehow expected a separate food item in each case so I was suprised how everything was united by the focus on pork (and Austria). Oh, and the wonderfully fluffy potatoes were perfect. Overall, a great success at our first music cooking challenge.